WxDFast is a browser add-on which works on Internet Explorer, Google Chrome and Mozilla Firefox. 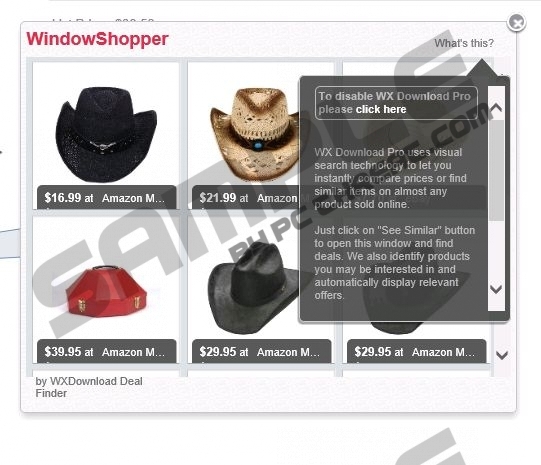 The application delivers various special deals, coupons and discounts to you, and the pop-ups are labeled “by WXDownload Deal Finder”. WxDFast provides you with the link to wxdownloadmanager.com, were an open source download manager is promoted. It is important to note that WxDFast is not related to a legitimate program called wxDownload Fast, which is available at various online sources. If you have installed WxDFast by accident and want to remove it from the computer, jump to the instructions provided below or implement a reliable spyware removal, especially if you want to make sure that you are protected against various computer threats. WxDFast is sponsored by different advertisers, whose ultimate goal is to make you visit their websites. If you have WxDFast on the computer, not only do you receive coupons and discounts but also some advertisements. They can appear in different forms and locations on the web page, and if you want to prevent computer damage, you should ignore all those ads. WxDFast may provide you with pop-ups saying that you have to install the latest version of the browser, which may end up with the installation of various potentially unwanted programs. One of the misleading domains that are aimed at making the users implement different free programs is update-browser.org, and if you access it, you should pay no attention to the recommendations provided. Additionally, WxDFast may also display jdj.openmace.net pop-ups. The content of such advertisements is likely to be deceptive, so if you want to prevent the annoying ads from being displayed on your screen, take actions to remove WxDFast from the computer. We recommend that you implement a spyware removal tool in order to remove the unwanted adware program. In this way, not only will you remove WxDFast; you will also provide the system with protection against computer infections. Our advice is to use SpyHunter because this application can remove the browser add-on in question and shield the system from malware and spyware programs. If you have decided to remove WxDFast manually, do not forget to scan the computer once you finish the removal. Quick & tested solution for WxDFast removal.